Hi there! You probably know that our atmosphere is mostly composed of nitrogen, its chemical symbol being N. It appears there as N2, i.e. a molecule of dinitrogen, which is composed of two atoms of nitrogen. It is usual to say nitrogen for dinitrogen, i.e. to make a confusion between the chemical element and the molecule. This compound is essential for the Earth to be habitable. The study I present today, Late delivery of nitrogen to the Earth, addressed the question of the origin of our nitrogen. The authors of this study, i.e. 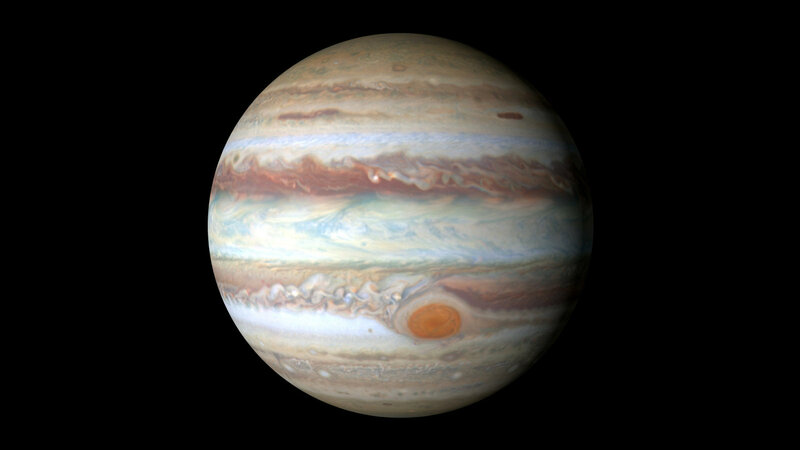 Cheng Chen, Jeremy L. Smallwood, Rebecca G. Martin and Mario Livio, are based at the University of Nevada, and the study has been recently published in The Astronomical Journal. This title is probably too ambitious. I just will tell you about some aspects of nitrogen (I must confess, I am no chemist at all). As dinitrogen, it is the main constituent of our atmosphere (some 78%). Moreover, this atom is present in the amino acids, in nucleic acids, i.e. DNA and RNA, and in many industrial compounds. You can find nitrogen in your coffee, you have some in propellants, in explosives,… Its liquid form can be used as a refrigerant,etc. The overwhelming presence of nitrogen in our atmosphere probably contributes to make it ubiquitous in our daily life. It is also very present in the universe. Actually, it is estimated to be the seventh in abundance in our Galaxy, i.e. the Milky Way. Interestingly, it exits under several forms. It can be combined with other elements, for instance in ammonia or in nitric acid, but can also exist as an atom. More precisely, there are several ways it can exist as an atom, since there are two stable isotopic form. And the relative proportion of these two forms is not constant in the Solar System, which may tell you something on the origin of the nitrogen you observe. As an atom, nitrogen has no electric charge, in the sense that the positive and negative charges balance. It is composed of a nucleus, around which 7 electrons orbit. Since these 7 electrons are 7 negative charges, the nucleus must contain 7 protons, to get a total null charge. However, the nucleus also contains neutral particles, i.e. neutrons, and the electric charge does not constrain their abundance. This opens the possibility for several versions of the atom of nitrogen to exist, which differ by the number of neutrons. That does not mean that you can put as many neutrons as you want in the nucleus, since the element you would create, or Mother Nature would create, would not be necessarily stable. In fact, nitrogen has two stable isotopes, which are denoted 14N and 15N, respectively. xN means that the nucleus is composed of x particles, i.e. 7 protons, which is mandatory to keep the electrical balance, and (x-7) neutrons. So, an atom of 14N is made of 7 electrons, 7 protons, and 7 neutrons, while an atom of 15N is made of 7 electrons, 7 protons, and 8 neutrons. Our atmosphere presents an isotopic ratio of 15N/14N of 3.676e-3, which means that 14N is overwhelming. However, in the Archean eon, i.e. between 4 and 2.5 billion years ago, the ratio was higher, i.e. 3.786e-3. This number comes from the analysis of Archean sedimentary rocks and crustal hydrothermal systems. However, the isotope 15N is more abundant in the comets. This leaves room for a possible enrichment of the Archean atmosphere in 15N by comets. The authors of this study tried to understand and quantify it. If part of the nitrogen comes from the space, then it should originate behind the nitrogen snow line. What is it? It is the line beyond which, nitrogen survives under a solid form (like ice). As you can understand, you get colder when you go further away from the Sun. The authors show that the nitrogen snow line is located at some 12 AU (astronomical units), which is somewhere between the orbits of Saturn and Uranus. Small bodies beyond that limit are mostly Trans-Neptunian Objects, i.e. they belong to the Kuiper Belt. You must find a way to put these objects into the orbit of the Earth. Beware that you do not deal with the current Kuiper Belt, but with objects, which were beyond the 12 AU limit some billion years ago. Interestingly, the authors present in their paper two different but complimentary aspects of this process. The first one is an analytical study of the excitation of the orbits of these objects by secular resonances, while the second one comes from numerical simulations. In physics, a resonance happens when the frequencies of two interacting phenomena get equal, or commensurable. 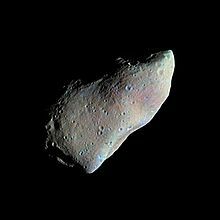 In celestial mechanics, this happens for instance when two objects have the same orbital frequency (example: the Trojan asteroids of Jupiter, sharing the same orbit with the planet), or one object orbits exactly twice as fast as another one. We speak of secular resonances when the ascending node of the orbit and / or the pericentre is involved. Here, the authors focus on the pericentre, since a resonant behavior involving it would result in the excitation of the eccentricity of the object. It gets resonant with a frequency forced by the system of the outer giant planets. If a Trans-Neptunian Objects gets an eccentric orbit, then this orbit will become more and more elliptical, and it will be more likely to reach the Earth. They particularly focused on the so-called ν8 frequency, which results in the most prominent secular resonance in the Kuiper Belt. This process being identified, it must be simulated, to estimate whether the comets undergoing this resonant excitation are likely to hit the Earth or not. For that, they used a well-known simulation code called REBOUND, which is a N-body integrator. In other words, it simulates the motion of several massive bodies, and is particularly suitable for long-term simulations. The authors simulated the motion of 50,000 virtual comets over 100 Myr. These comets were initially uniformly distributed between 38 AU and 45 AU. This resulted in 104 collisions with the Earth. Using such a numerical code is of high interest, because it not only renders the behavior of the secular resonance which is mentioned above, but also of all the gravitational interactions with the planets. These interactions include mean-motion resonances with Neptune. The authors estimate that it can be deduced from their simulations that between the comets delivered between 1022 g and 1023 g of material to the Earth, which would translate between 3.9 x 1019 and 3.9 x 1020 grams of nitrogen. This would represent some 10% of the total nitrogen present on Earth. and the one of Mario Livio. Hi there! You know the thunderstorms on our Earth. In fact, you can have thunderstorms once you have an atmosphere. And you have many atmospheres in our Solar System, particularly on the giant planets. 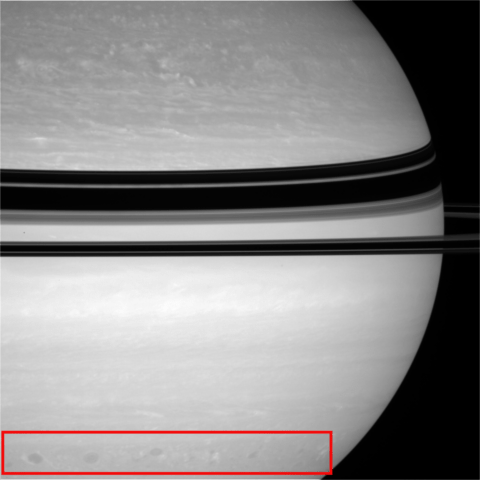 Today we describe a thunderstorm on Saturn, which happened between November 2007 and July 2008, and was observed by Cassini. This thunderstorm is described in Analysis of a long-lived, two-cell lightning storm on Saturn, by G. Fischer et al. This study will be published soon in Astronomy and Astrophysics. Basically, a thunderstorm results from the encounter between cool and hot air. For instance, after a hot summer day, you have hot air in the low atmosphere, while colder air is brought by the wind. Then the hot air, which is lighter, gains altitude. This convective motion induces displacements of electric charges, and so a difference of electrostatic potential between the ground and the top atmosphere. This difference in electrostatic potential creates electric lightning, which actually balances the charges between the sky and the ground. All this results in unstable weather conditions, in particular rain and strong wind. The rain is due to the moist contained in the hot air, which coalesced as clouds while gaining altitude. Thunderstorms are among the most dangerous natural phenomena. As I said, you can have thunderstorms on any planet with an atmosphere. Today, we are on Saturn. The radius of Saturn is about 60,000 km, which corresponds to the distance to the center, where the atmospheric pressure reaches 1 bar. At its center Saturn has probably a rocky core, which radius is about 25,000 km. This leaves room for a very thick atmosphere, i.e. what I would call the Saturnian air, mainly composed of molecular hydrogen and helium. 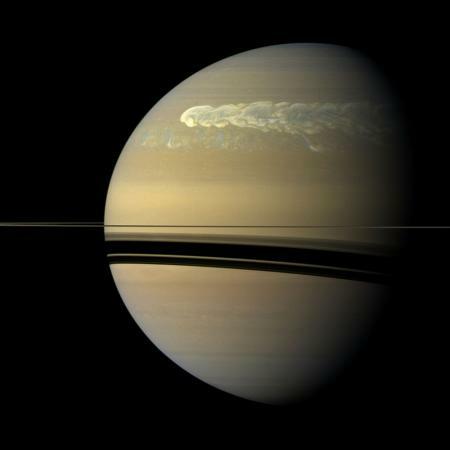 Interestingly for us, there are clouds in the atmosphere of Saturn, which composition depend on the altitude, itself correlated with the pressure. 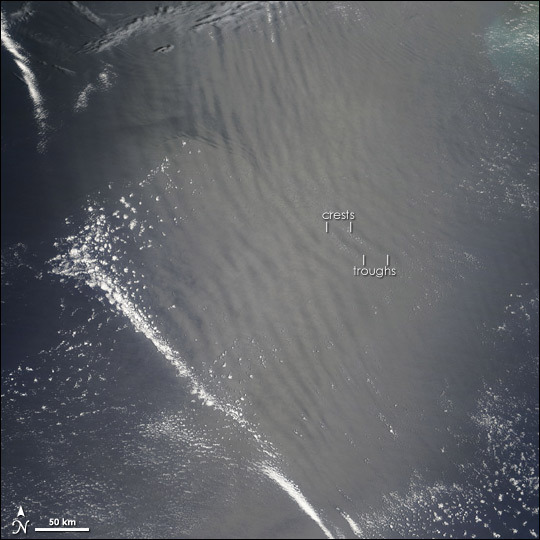 The less dense clouds (up to 2 bars), in the upper atmosphere, mainly consist of ammonia ice, while denser clouds contain water ice. The densest clouds, which pressure exceeds 9.5 bars, contain water droplets with ammonia in aqueous solution. System III: spin period of 10 h 39 min 22.3 s, for the radio emissions. To be honest with you, I did not manage to get an exhaustive list of the detected events. By the way, if you have some information, I would be glad to get it. You can comment at the end of this article. You can find below a list of thunderstorms, which have been detected by the Cassini spacecraft between 2004 and 2010. The study we discuss today is on the Storm F.
These events were identified in detecting radio emissions, due to Saturn electrostatic discharges (SEDs for short). Before that, the Voyager spacecrafts have detected SEDs in 1980 and 1981, but attributed their origins to impacts in the rings. Since then, other events have been detected. In particular, Great White Spot events, i.e. huge disturbance encircling the planets, can be seen from the Earth. They seem to appear roughly every 30 years, which could be correlated with the duration of Saturn’s year (29.46 years). The last Great White Spot has been observed in 2010-11. As I said, these events are usually detected thanks to their radio emissions. For that, Cassini disposed of the Radio and Plasma Wave Science (RPWS) instrument, equipped with a High Frequency Receiver. This receiver listened to Saturn in 3 different modes alternatively, allowing to cover a pretty wide range between 325 and 16025 kHz. These radio measurements were supplemented by optical observations by the Cassini ISS (Imaging Science Subsystem), by optical observations from Earth, and even by Earth-based radiotelescopes, for the strongest discharges. The detection of such events strongly depends on the location of the spacecraft with respect to the storm. When the spacecraft is opposite to the storm, you detect almost nothing. Almost, because measuring radio emissions permits over-the-horizon detection, especially when the SED storm is located on the night side (opposite the Sun) and Cassini on the day side. This could be due to a temporary trapping of the radio waves below Saturn’s ionosphere before they are released. So, Cassini’s RPWS detects the discharges, ISS and the Earth-based telescopes see the storms… Let us see the results for the Storm F (November 2007 to July 2008). RPWS detected about 277,000 SEDs related to this Storm F. But the analysis of the images revealed two phases. From November 2007 to March 2008, ISS saw one convection cell, at the latitude of ~35° south. And in March 2008 a second cell appeared, at roughly the same latitude, and separated from the first cell by about 25° in longitude. These two cells drifted both of about 0.35° per day. The presence of these two cells with a correlated motion makes this event a very interesting one… and the authors also detected dark ovals. 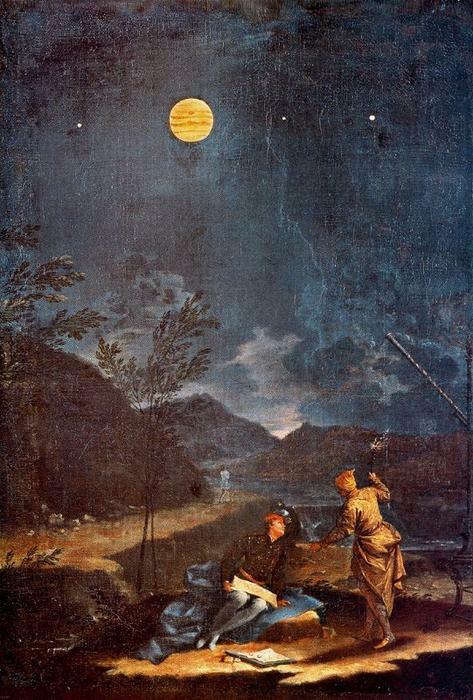 A storm appears as a a bright spot, while a dark oval is a dark one. Several dark ovals were seen, the largest one, nicknamed S3 drifted by 0.92° per day, i.e. much faster than the storms. These dark ovals have probably no SED activity. Several explanations have been proposed to explain these features. They could either be clouds of carbon soot particles, produced by the dissociation of methane in the lightning channels, or remnants of convection cells, in which the ammonia particles have fallen deeper into the atmosphere, leaving darker spots. So, this paper describes the event. The physics behind still needs some clarification, so you can be sure that devoted papers will follow. Stay tuned! and the one of Donald A. Gurnett. Anyway, our Earth is our home, and as such, it is of the uttermost importance. In particular, the global warming threatens it, and threatens the mankind itself. This is why we must study the Earth, but don’t worry, the Earth is studied. Today I present simulations of the climate that the Earth would have, if it rotated backwards, at the same rate. Of course, this is a theoretical study, which does not reproduce a real situation. But this is anyway interesting, because it permits us to understand the role of the different factors, which affect the climate. What is the role of the spin direction? This is the question this study answers. The study is The climate of a retrograde rotating Earth, by Uwe Mikolajewicz et al., and it has recently been published in Earth System Dynamics. The obliquity of the Earth, or axial tilt, is responsible for the seasons. The rotation axis of our Earth is not orthogonal to its orbital plane around the Sun (the ecliptic), but is tilted by some 23° (somehow the angle between your index and your middle fingers, when you open your hand). The consequence is that the two poles do not see the sunlight six months a year, alternatively. And the other regions of the Earth have varying day durations, which affect the temperature. You have the seasons. The team of Jacques Laskar (IMCCE, Paris Observatory) has shown that the Moon stabilizes the axial tilt of the Earth (see here). In other words, a moonless Earth would have experienced large variations of the axial tilt, hence large variations of the climate. So large that they may have threatened the development of life on Earth, since we need to adapt to the climate. We can do it when the changes are slow enough… and our fear with global warming is not (only) the warming itself, but its acceleration… Anyway, we are alive thanks to our Moon. In fact, the astronomic forcing affects the climate on a wider range. The Serbian geophysicist and astronomer Milutin Milankovi&cacute; has hypothesized (and this has been confirmed by several teams since then) that the variations of the orbit and the rotation of the Earth were responsible for the paleoclimates. This theory is now known as the Milankovi&cacute; cycles. But astronomic forcing is not everything. This affects the insolation of a given place, providing some energy to heat the Earth (not the whole energy actually, but let us neglect this point). Once a planet is illuminated, it responds… and the response depends on its constituents, the atmosphere playing a critical role. As you know, our Earth is surrounded by an atmosphere, which is a layer of air, mostly composed of nitrogen and oxygen. Its pressure decreases with the altitude, 3 quarters of it being in the 11 lowest kilometers, while the boundary at the atmosphere is considered to be at about 100 km. This atmosphere is responsible for greenhouse effect, which heats the surface. It also increases the pressure, this permits the existence of liquid water. Moreover, it protects us from ultraviolet radiation, meteorites (many of them being fragmented when encountering the atmosphere), and allows us to breath. You can forget life on an atmosphereless Earth. Beside this, the atmospheric circulation redistributes the thermal energy on Earth. You know the winds. More precisely, this circulation is structured as cells, which take hot air at given locations of the surface, before releasing it back somewhere else. The main effect is due to latitudinal cells (Hadley, Ferrel, and polar cells), which permit heat transfers between different latitudes, but there is also a longitudinal motion, known as zonal overturning circulation. Oceans play a key role in the regulation of our climate, since they have a kind of thermal inertia, which affects the temperature of the coastal areas. I mean the oceanic currents, which are water displacements. This may transfer hot water to colder regions, and conversely. An example is the North Atlantic Drift, aka Gulf Stream, which is responsible for the pretty moderate winters in Europe, while Canada freezes. There are also currents designated as gyres, since they have a pretty circular motion on a very large scale. Moreover, you also have formation of water masses in the Atlantic, i.e. masses of water, which properties (temperature, salinity,…) are pretty homogeneous, and different from the surrounding waters. Atmospheric and oceanic circulations are influence by the Coriolis effect, which is the consequence of the Earth rotation… and this study is on the influence of the Earth rotation. Let me mention anyway the influence of the land, which of course blocks the oceanic currents, and also may affect the atmospheric ones, in particular if you have mountains. and polar climates (the coldest ones). You cannot pretend simulating the climate of the Earth if you don’t get these 5 climates. The authors are experts in climate simulation. This is a very difficult task, since you have to implement the interactions between all the physical parameters (insolation, oceanic currents, atmospheric circulation,…), in a code which is non-linear and depends on multiple variables. Basically, when an equation is non-linear, you cannot simply derive its solution. Instead, you need to integrate the equation numerically, and the solution may be very sensitive to your parameters, your initial conditions (how is the climate when you start the simulations? ), and your numerical scheme. In particular, you split the atmosphere and the oceans on a grid of finite elements, and your numerical code simulates the solution element by element, time after time. This requires high performance computing tools. The authors dispose of a dedicated numerical model, the Max Planck Institute Earth System Model (MPI-ESM), which couples the atmosphere, ocean and land surface through the exchange of energy, momentum, water and carbon dioxide. This homemade tool has been developed after years of study. It interfaces the simulations of different physical processes, all of them having been developed and improved since many years. The authors have used the MPI-ESM many times in the past, which makes it reliable. and RETRO. To each CNTRL simulation corresponds a RETRO one, in which the Earth rotates backwards. Each set is composed of 1,850 climate conditions (i.e. 1,850 different simulations), over 6,990 years. The authors point out that the simulations should be over a long enough duration, to permit the climate to reach an equilibrium state. The simulations show that in practice, the equilibrium is reached in some 2,000 years. the inversion of the Sun’s diurnal march in the calculations of radiative transfer. And one the simulations have run, they get the results. The question you may ask is: would that affect the global temperature of the Earth? It appears that no. You have no change on average, I mean the mean temperature remains pretty the same, but you have dramatic local changes. Let me emphasize two of them. As you can imagine, the inversion of the rotation results in inversion of the oceanic currents and the zonal winds. No need to run the simulations to predict this. But the simulations show unexpected things. The Atlantic ocean is known for its water masses, and the CNTRL simulations get them. However, the RETRO simulations do not have them in the Atlantic, but in the Pacific Ocean. Another change is that the monsoons occur in the Sahara and Arabian Peninsula. This dry area, made of desert, would be a forest if the Earth rotated backwards! However, the world’s biggest desert would have been in the Southern Brazil and Argentina. You can finally ask: why the authors did this study, since a backward rotating Earth is not realistic? Just because we need to fully understand the climate, and the rotation direction is one of the effects affecting it. We do not know whether this could apply to an extrasolar planet, or whether the results would help us to understand something else… That’s research, but trust me, it is useful one! Climate science has become a critical topic. the Max Planck Institute Earth System Model. and the webpage of Bjorn Stevens.